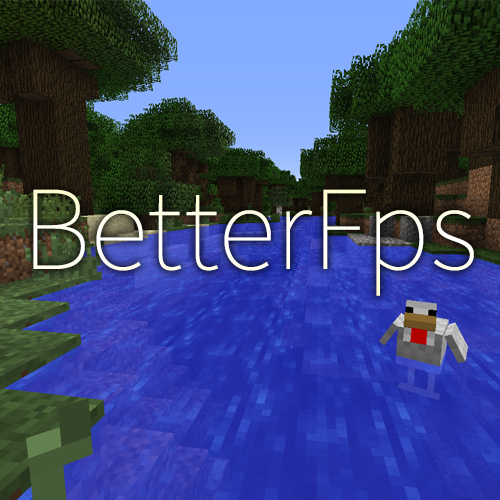 BetterFps is a Minecraft mod that add a few performance improvements, trying to be compatible with other mods. If you have two screenshots comparing with and without, PM me. These screenshots are outdated and many improvements have been implemented since then. All improvements can be enable or disabled in the config file (config/betterfps.json) or in the options menu (Options -> BetterFps Options) (For older versions, press F12 while in game). Changes sin() and cos() algorithm. There are 7 algorithms. Each one of them may or may not help you, it really depends on the hardware of your computer. Currently, it's pretty similar from what FpsPlus used to do, but it doesn't edit base classes. I have plans to expand this, not in more algorithms, but in algorithm generation based on benchmarks. Affects both client-side and server-side. Removes a RAM preallocation of 10MB. This allocation was added to prevent players from starting the game with low memory, but this allocation is kept until its almost the memory reaching its limit. This was made just for players using modpacks, where memory might be a problem. If you have enough memory, this is pretty much useless for you. Removes the fog. The fog creates a lot of lag, why not add an option to remove it? Removes the transparent layer of the beam. It might help it when there's a lot of beacons. Experimental - I'm still testing if it actually helps anyone, I might remove it. Hoppers are very unoptimized, they keep checking for items to pickup when there's no need for it. Simply putting a solid full block on top of it stops looking for items to pickup. Recently, Forge has added the new capability API, which forced me to remove others improvements. I might reimplement them in the future. Beacons are also unoptimized, the code processes stuff that it didn't need to. Not only it was recoded thinking in performance, the code was also organized for processing stuff only when it needs to. The creative mode search is really unoptimized, in big modpacks, the pressing any key in the text input would freeze the game by a few moments. This improvement implements a smart search algorithm, reusing old results for new searches. It will also prevent any non-alphadecimal key (such as shift) from updating the search. If you want to check if the mod is installed, you can open the options menu, it should have a BetterFps button in there. Change the installation directory, version and profile according to your preferences. You may add this mod to your modpack if I'm credited (Guichaguri) and you link this page. You can only distribute the mod in modpacks. Do not repost this mod or claim ownership, all versions are only uploaded to CurseForge. Optifine: Overwrites Fast Math when the algorithm is not set to "Vanilla"
If you have issues with this mod, report here. My game crashes when i try to open a ender chest. Please, send the crash logs and the mod list. One of my friends is having trouble with installing your mod, the dropdown list of versions has no versions. when benchmarking with the jar, it does not consider an installed optifine, i assume? so, when i get vanilla algorithm as fastest, its not the optifine fast math, is it? If you want to check whether the mod was installed or not, press F12 while in-game to open the options menu. If you're using a newer version, there is a "BetterFps options" button in the options screen. i see, thanks for letting me know. "Doesn't work" doesn't help me help you. What exactly happens? Which is the best for me? By the way, happy new year! For all those who are unsure which algorithm to use, this guy's got the right idea. To clarify, after downloading the file, just double click it as you normally would when opening any file. It will run and show a dialogue box, just click on"Test algorithm" and you're good to go! Make sure to repeat the procedure 3 times and pick the algorithm with the lowest ms in game, or in the window itself after the test! Which one is the best for me?